Tasting TOBAGO: One Bite & Culinary Sight at a Time! Tobago is a food lover’s paradise chock-full of delicious food, culinary gems in surprising places and a rich agricultural history that yields beloved edible treats. Here are 10 great ways to go beyond the beach, and get a taste of Tobago and explore its culinary traditions. #1 Tobago Cocoa Estate – Nestled in a Roxborough valley with fantastic views of the Atlantic Ocean, this working cocoa plantation was revitalized in 2005 by Duane Dove. Today, the Tobago Cocoa Estate sells award-winning chocolate worldwide and offers walking tours of the expansive 47-acre estate. Guests can learn about Tobago’s cocoa history and ‘love up’ the bean by breaking open a cocoa pod for a taste of the seeds, sampling the estate’s chocolate bars or buying cocoa balls. Be sure to try the fresh cassava bread baked in the estate’s dirt oven (cassava is grown as cover for the cocoa trees). TriniChow TIP: If you’re visiting during the high season, inquire about the estate’s rum & chocolate tasting. Link to our Tobago Cocoa Estate pictures. #2 Scarborough Market – Tobago’s only public market is a must see for food-enthusiasts. Keep an eye out for our favourite local market treats, including hand-cranked coconut ice cream, pomegranate wine, roucou, coconut oil, dried herbs, and freshly-baked coconut drops. For shoppers looking to stock up on groceries, Scarborough Market vendors also sell produce, fresh meats, seafood, poultry and free-range eggs. Saturday (mornings) are the ideal day when the market is liveliest and full of vendors. TriniChow TIPS: Take the time to talk with the vendors, and connect with the market community and a little piece of Tobago. Also, if you see or hear the pie man in the market, ‘hail him out’ for one of the best whole wheat pies we’ve ever tasted. Link to our Scarborough Market pictures. #3 The Blue Crab – Grab lunch at The Blue Crab in upper Scarborough for a plate full of home-style Tobago cuisine and warm greetings that always make lunch here feel like a welcome back meal. The focus at this cozy family-run restaurant is on well-executed mains (usually fish or chicken) and side dishes made from fresh local produce and seasonal ingredients. On our last visit, we eagerly tucked into grilled king fish, stewed pigeon peas, boiled provisions, curried bodi beans, fried plantains and salad, and washed it down with freshly-made lime juice. TriniChow TIP: Ask Mrs. Sardinha to explain the display case of local culinary artifacts. Link to our Blue Crab pictures. #4 Tobago Rain Forest Reserve – Surprised to see the rain forest on this list? The history of this lush rain forest provides a unique window into Tobago’s agricultural past, when sugar and cocoa were king and later when Tobago was the food basket for Trinidad. Of course, the Reserve delivers the full rain forest experience with tropical bird-watching (and calling), a canopy of soaring trees, stunning waterfalls, and more. But as food lovers, we were thrilled to see the culinary gifts of the forest — wild coffee and cocoa trees, nutmeg trees and streams full of crayfish. Be sure to hire a TTTIC certified tour guide. Hans Phillips of Hans Tours (868.759.2880) and Chance Darlington (868.660.7823 or 868.734.4534) were our very knowledgeable tour guides. TriniChow TIP: On the way back into town, ask your guide to stop at Gee Bee’s Bakery for pastries or King’s Bay Café for a quick lunch and a great view. #5 Souse in Tobago – Anyone for chicken feet, pig feet, cow heel or conch souse? This “heritage food” or local delicacy of pickled meat is one of T&T’s beloved street foods, serving as weekend cutters, a Carnival-time staple and even a rumored antidote to hangovers. Souse has a long proud history in several Caribbean countries as it was the slaves’ answer to very limited meat options and the British tradition of sousing — preserving fish (in this case) in salty water or vinegar. TriniChow TIP: Judging from the long line of souse-lovers every Friday night around 5pm, the souse lady outside the Canaan Penny Savers has Tobago’s best souse. Link to our souse pictures. #7 Kariwak Village Restaurant – An institution in the Tobago culinary landscape, Kariwak Village’s restaurant is a long-time favourite of both tourists and locals. They all come to taste Cynthia Clovis’ sweet hand and revel in the restaurant’s natural surroundings. Breakfast, lunch and dinner (buffet-style on Fridays and Saturdays) are largely fashioned from locally-sourced ingredients, including herbs and vegetables from the hotel’s garden. The not-to-be-missed Friday and Saturday dinner buffet is a full spread, think Marinated Cauliflower Salad, Baked Fish w/Dill, Lamb Chops w/Herbs, Savoury Rice, Oven-Baked Potatoes, Stewed Bhodi Beans and for dessert – Coconut Sponge Cake, Chocolate Cream Pie or Housemade Ice Cream.) TriniChow TIP: If you have time, take a stroll through Kariwak’s gorgeous gardens behind the hotel and pick up a copy of Kariwak’s cookbook, “Cooking Kariwak Style, Tastes of Tobago.” Link to our Kariwak pictures. #8 Castara Heritage Bakers’ Oven – In Tobago on a Wednesday or Saturday? Consider making the drive up to Castara’s beachfront bread shed and dirt oven for a taste of an ‘ole time’ baking method. Twice a week the bakers turn out traditional breads, sweet breads, buns and tarts from this community oven, created 17 years ago to fund raise for the Castara Government School. Community and private dirt ovens date back nearly one hundred years, but today they’re increasingly rare in Trinidad & Tobago and vanishing quickly. The Castara Heritage Bakers have freshly baked treats on Wednesdays and Saturdays from about 11am. TriniChow TIP: Call ahead 868.639-5634 to reserve your desired baked items or go early. Link to our Castara Oven pictures. #9 Tobago Culinary Festival & the Tobago Blue Food Festival – Time your Tobago trip in June or October and you can experience Tobago’s largest annual culinary events. Generally carded every year in June, the Tobago Culinary Festival treats guests to cooking competitions, demonstration kitchens, mixology competitions, and of course the cuisine of local restaurants and caterers. Meanwhile, October’s Tobago Blue Food Festival is focused on celebrating the ever-popular dasheen, a humble but versatile blue food. If you’re lucky enough to be in Tobago in October, this blue food fete is not to be missed as it’s a fantastically delicious example of how Tobagonians have maximized the culinary possibilities of this ground provision. TriniChow TIP: More information on both festivals can be found here. 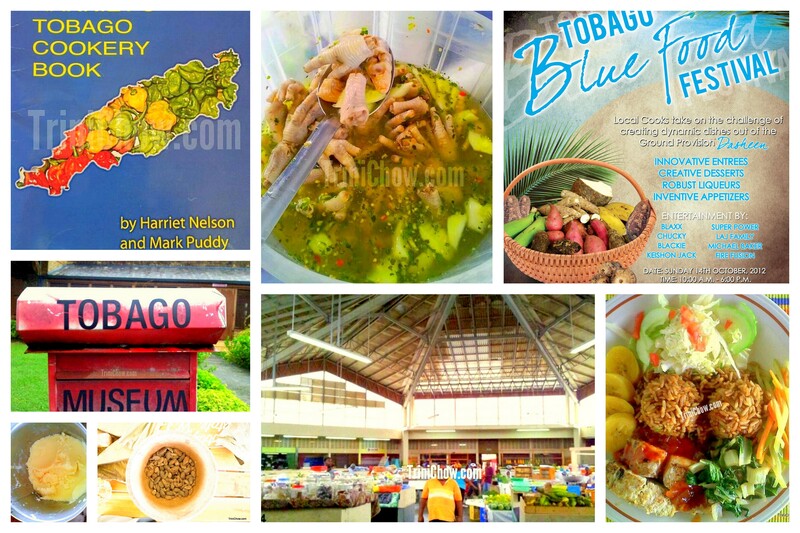 Links to our Tobago Blue Food Festival and Tobago Culinary Festival pictures. #10 Harriet’s Tobago Cookery Book – We know you can’t visit a cookbook, but it made the list because there’s no better way to bring back a slice of tasty Tobago to your kitchen. This simple cookbook shares “Tobago’s cooking secrets” and local favourite recipes like Souse, Cassava Dumplings, Curry Crab, Breadfruit Pie, Callaloo, Oil Down, Coo Coo, Benne Balls and a proper Cocoa Tea. TriniChow TIP: Shore Things Café & Craft in Lambeau is the best place to purchase Harriet’s Tobago Cookery Book. Call ahead (868.635.1072) to pre-order the book or ensure it’s in stock and take the time to enjoy a lovely seaside lunch at the cafe. Link to Shore Things Cafe pictures. Hi.. do have a # for the souse lady in Canaan? Do the Castara Heritage Bakers bake on Thursday and Saturday or Wednesday and Saturday? Also, you mention its good to call ahead. Do you have a phone number? Hi Bess. The baking at Castara’s community oven is on Wednesday and Saturday (sorry about that). It may take a few days, but we’ll try to dig up a number for you (our contact no longer lives in the village). Thanks Alicia. We’ve received conflicting information on the baking days now have final confirmation that the days are Wednesday and Saturday.